NETWORK FINALS: AMERICAN IDOL and KEVIN CAN WAIT rose 0.1 in final numbers. CABLE HIGHLIGHTS: USA’s WWE telecast led Monday cable with big gains from last week at 1.50/1.49/1.40, compared to 1.22/1.21/1.15, followed by a NINJA VS NINJA episode at 0.31. On VH1, LOVE & HIP-HOP gained 0.11 to 1.04, TEYANA & IMAN ticked up to 0.72, and LEAVE IT TO STEVIE was also up a tick to 0.55. On MTV, TEEN MOM jumped 0.13 to 0.67, and its YOUNG & PREGNANT lead-out hour was up 0.06 to 0.38. On Bravo, VANDERPUMP RULES slipped 0.02 to 0.59. 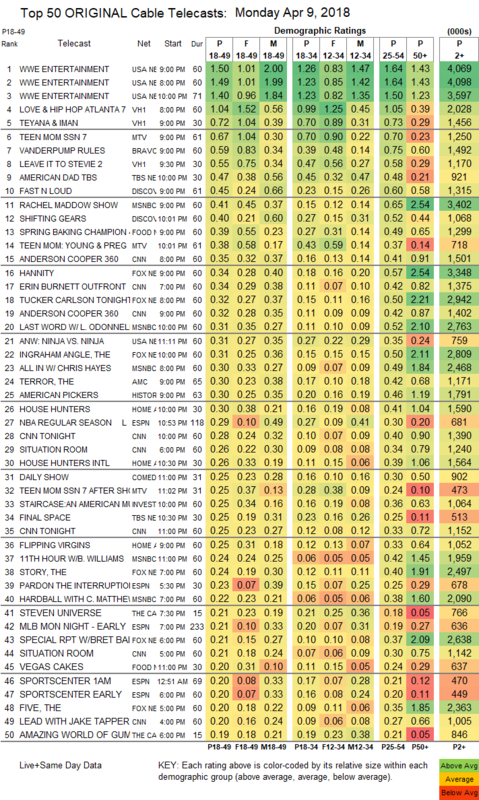 On TBS, AMERICAN DAD returned from last week’s NCAA Tournament break at 0.47, and FINAL SPACE was at 0.25. On Discovery, FAST N LOUD had a 0.17 leap to 0.45, and the season finale of SHIFTING GEARS was up 0.11 to 0.40. MSNBC’s RACHEL MADDOW SHOW rode the raid on Michael Cohen’s office to 0.41/0.65/3.4M, over CNN’s ANDERSON COOPER 360 at 0.35/0.41/1.5M, and Fox News’s HANNITY (despite that show’s awaited response to Jimmy Kimmel) at 0.34/0.57/3.3M. 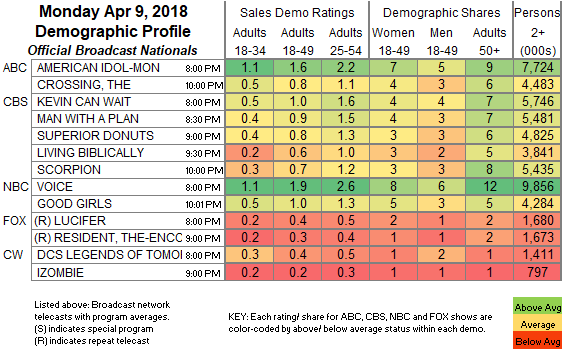 Food Network’s SPRING BAKING CHAMPIONSHIP climbed 0.07 to 0.39, followed by CAKE MASTERS at 0.28. On AMC, THE TERROR gained 0.03 to 0.30, and MCMAFIA was up 0.01 off the chart at 0.05/182K. History’s AMERICAN PICKERS rose 0.13 to 0.30. On HGTV, HOUSE HUNTERS added 0.04 for 0.30, HOUSE HUNTERS INTL ticked up to 0.26, and FLIPPING VIRGINS was up 0.04 to 0.25. ID continued its series THE STAIRCASE at 0.25, preceded by EVIL TALKS at 0.19. Lifetime’s UNREAL gained 0.05 to 0.12, and MARY KILLS PEOPLE aired its season finale episodes at 0.09/0.08, compared to last week’s 0.08 hour.